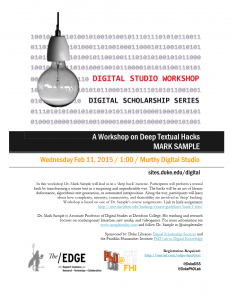 The Murthy Digital Studio, in conjunction with the Duke PhD Lab present an afternoon with Dr. Mark Sample! 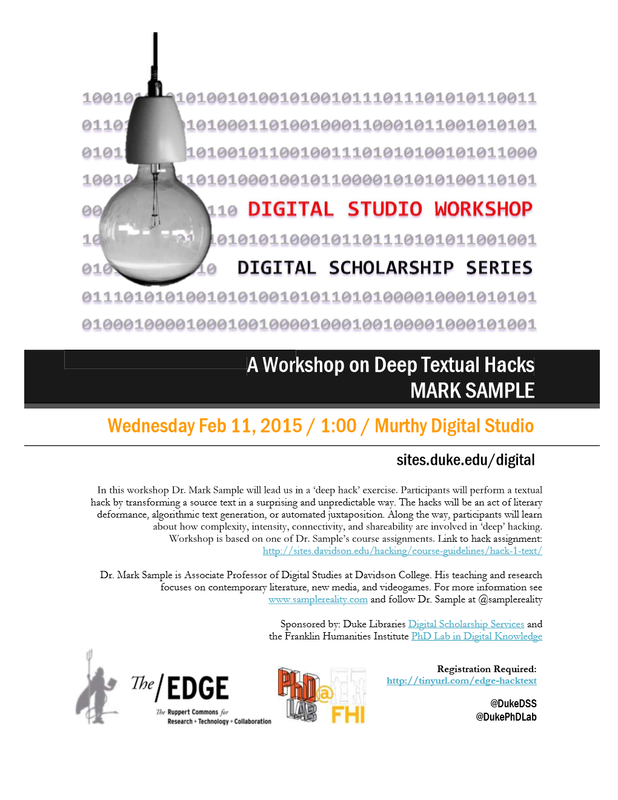 In this workshop Dr. Mark Sample will lead us in a 'deep hack' exercise. Participants will perform a textual hack by transforming a source text in a surprising and unpredictable way. The hacks will be an act of literary deformance, algorithmic text generation, or automated juxtaposition. Along the way, participants will learn about how complexity, intensity, connectivity, and shareability are involved in 'deep' hacking. "Deformance" has gained traction in recent years as an alternative mode of humanistic inquiry. First proposed by Jerome McGann and Lisa Samuels in 1999, deformance is premised upon deliberately misreading a text. In this talk I couple deformance with Nick Montfort's more recent call for “exploratory programming” in order to challenge what counts as scholarship in the 21st century. In particular I argue that digital humanists need to create work that theorizes and thematizes breakdown, maintenance, and disrepair—all states of being we must necessarily grapple with if we truly want to understand the way the world works, and the way it doesn’t. Join a panel of artists, researchers, instructors, and computer programmers to discuss the role of 'hacking' in humanities research, teaching, and artistic practice. Panel members will engage the definition of hacking, as well as the term's historical trajectory and its contemporary use, and will present various examples of academic 'hacks'. We'll ask: Is 'hacking' more than a simple buzzword when used in academia? How can we productively co-opt 'hacking' for pedagogical and research purposes? What role does hacking play in the humanities? It promises to be a provocative and engaging conversation! Professor Sample’s teaching and research focuses on contemporary literature, new media, and videogames. His examination of the representation of torture in videogames appeared in Game Studies, and his critique of the digital humanities’ approach to contemporary literature is a chapter in Debates in the Digital Humanities (University of Minnesota Press, 2012). Mark has work in Hacking the Academy, a crowdsourced scholarly book published by the digitalculturebooks imprint of the University of Michigan Press. Mark has remixed the entire text of Hacking the Academy as Hacking the Accident. Mark’s most recent project is 10 PRINT CHR$(205.5+RND(1)); : GOTO 10, a collaboratively written book about creative computing and the Commodore 64, which was published by MIT Press in November 2012. For more information, see samplereality.com/about. Digital Metabolism goes to Duke Library! Hacking the Academy Is Live! 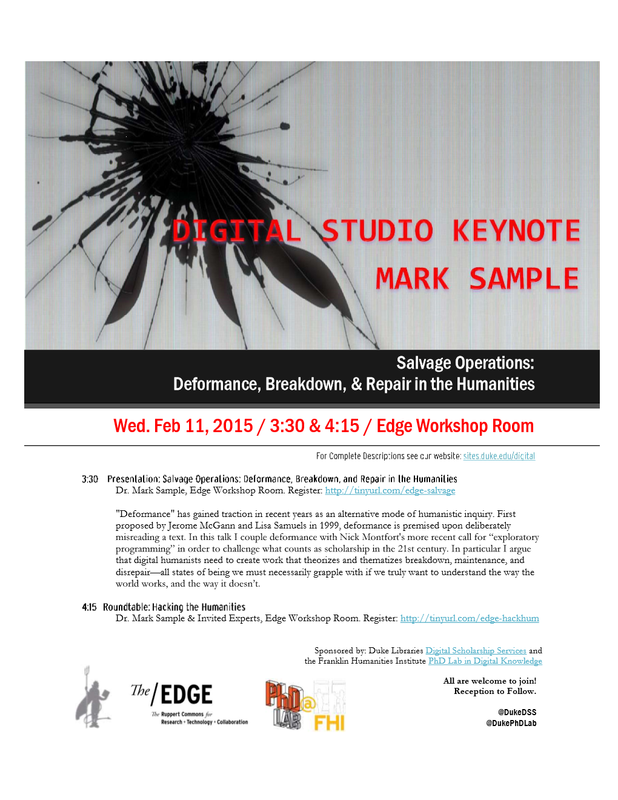 Duke Digital Studio kicks off its DH Sandbox Chats! Duke Digital Studio What I Do with Data Event - The S-1 Lab 3D prints personal data and creates AR garden gnomes!